Minimalism is a word often heard in golf course design circle these days. The concept is to move as little earth as possible in an effort to preserve the original terrain and produce a facility that is a natural extension of its place. The first golf courses, discovered within the dunes and drifts of Scottish seaside towns are the epitome of minimalism. Modern courses, designed through discovery and nominal change to the land are a return to the essential roots of golf and its intimate connection with nature. During the construction of Whistling Rock, I was attending an event in Australia with a group of golf course architects from Europe, Australia and North America. The event was called the “Search for Mackenzie” and the group had the opportunity to play Royal Sydney, New South Wales, Metropolitan, and Royal Melbourne, before finishing with a visit to Kingston Heath during the Australian Open (Yes, that’s me on the famous fifth at Royal Melbourne – if one looks closely, the flag is still moving from the vibration of my ball hitting the cup). First off, minimalism is a wonderful and necessary design approach, in fact, I’m often envious of an architect who gets to discover the golf course within natural golfing ground. However, the passion by which it’s discussed these days appears to be in response to a sixty year stretch in design between 1930 and 1990 that many might term the “un-golden” age. In this period, golf design assumed a more manufactured approach as a result of more and better tools to move earth. Having grown up around a group of architects of this era, they seemed to convey a “can do” attitude typical of the “great generation” of World War Two. Why, they figured, should we accept less than ideal conditions when we have the tools and capacity to change them. The post-war era also saw a rise in golf popularity and an increase in demand for new courses, often in locations and on sites with little to remind anyone of traditional golfing ground. 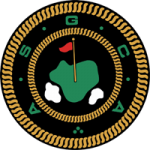 Granted, many courses produced in this manner could be formulaic and offer less individual character, but some within the game seem to feel they should never have been built. If one can’t build minimally, one shouldn’t build at all. What nonsense! I am not an advocate of grading when it isn’t absolutely necessary; one only has to look at the work of David Kidd or Bill Coore to recognize the art and originality when golf design is approached mimimally. In fact, to grade more than minimally on natural golf ground, is an anathema. But, to suggest a course not built in this fashion is a lesser citizen is to ignore the vision and talent need to turn a North Las Vegas industrial site into the hills of North Carolina, which Tom Fazio did so amazingly well at Shadowcreek. These approaches represent two different types of design: the former, the art of discovery and highlight, much as an artist might recognize the form and character of a piece of driftwood found on the beach; the latter, the art of creating something from nothing, much as a sculptor might do with a square block of stone. Both require vision and imagination, but the methods of achieving the objective are very different. One does not take a hammer and chisel to a polished piece of driftwood, but the sculptor cannot realize the potential in a block of stone without them. Back before the “non-golden” era, when shovel and mule were the tools available, site selection was paramount. I’m sure George Crump had his choice of thousands of acres in and around Philadelphia before settling on the site that would become Pine Valley (although he did tear out 20,000 trees). Today, such choices are more rare. 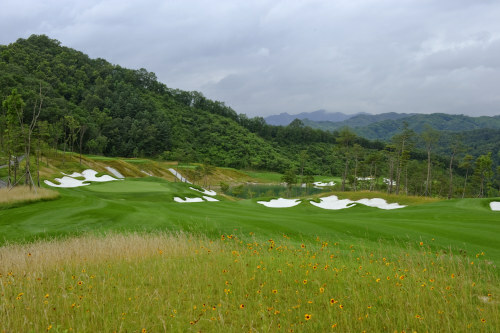 Often as not, modern golfing sites are a cast off, land not particularly conducive to an alternate use, or flat featureless converted corn fields, or like Whistling Rock, mountainous sites more conducive to raising goats. In these instances, trying to minimize grading is counter-productive. In fact, if one is trying to develop a course on a site with little natural character or extreme topography, it won’t be successful if approached half way. Unfortunately, I’ve visited many sites ( especially in the mountains) where grading has fallen short. In the name of minimalism, some have sought to restrict changes to the land form, resulting in a course that may only truly be enjoyed by goats. Other times, a site has been terraced like a wedding cake in an effort to create ground only a flatlander might love. In these situations, I can understand why critics might believe such projects shouldn’t have been built. However, to dismiss a project or a design simply because the site required and demanded the movement of a large volume earth is to dismiss a large portion of golf courses being built today. Seems to me this attitude is an awful lot like a fan of realism dismissing impressionism because it’s blurry. Yes, well, if one’s principals prevent a level of grading needed for a site to reach it’s full potential, let me know….I’d be happy to do it. 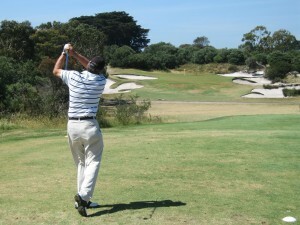 Golf Design, Minimalism, Robinson Golf, Royal Melbourne, Ted Robinson Jr.